There isn't anything better than fair time, because the ridiculous new foods and the old favorites are there for mass consumption and enjoyment of all. We like the animals, we like the rides, but really when it all comes down to it, we're there for the festival of EAT. We ended our day this year with deep fried Milky Way - which is now a staple rather than nouveau, and something different - deep fried Pecan Pie. I give the pecan pie a B, it wasn't completely done, and although it was still good because the pie inside was cooked, it was cold in one small spot. But still, pecan pie. WIN. 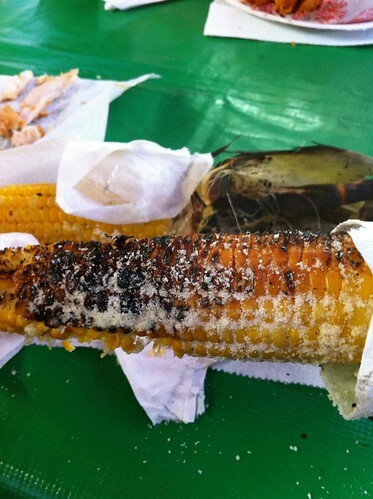 Roasted corn, accompanied by fresh squeezed lemonade - that I suspect to be Country Time - is also a required staple food. I'm a fan of shaking Parmesan cheese on mine. 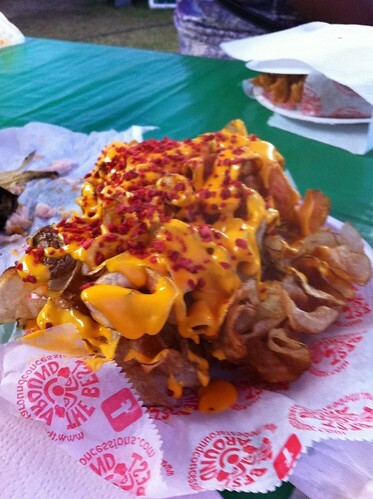 The twisted fries are good, especially with baco-bits (NOT bacon, bacon's lesser cousin) and cheese food product from a can. They're like - this hot potato chips. With fake cheese and fake bacon. 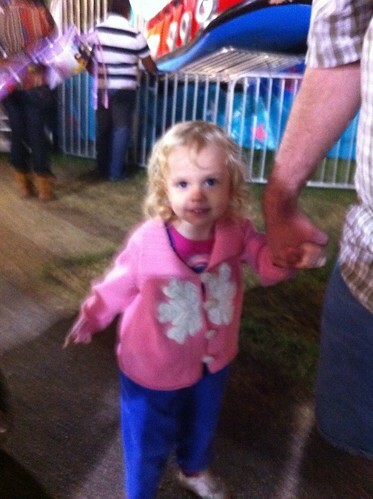 The girl was ecstatic at all the "nummy treats" as she calls them and the fun rides she got to do. She had just finished riding a dinosaur in the above picture, so how can that be bad? 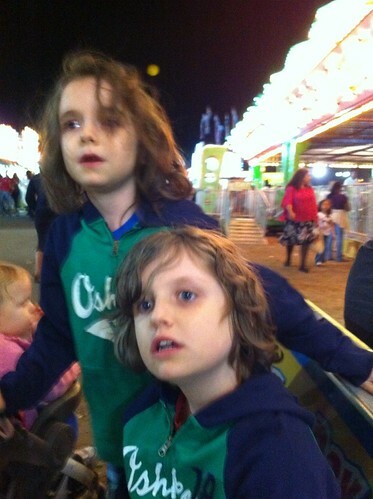 The twins loved it too, if they look a little pensive above - it's because we are sitting next to the speak for the Haunted house. SPOOOOOKY noises are blaring right near us, and they are trying to sort out what it is. Now that we've been to the fair, fall is landing on us hard. Cold drizzly rain, very chilly mornings, all of these things have started with regularity. I'm glad really. Summer was long and hot. I am ready for some cold.